I wanted my son to understand that life is about taking risks, being authentic and living fully regardless of fear or anticipated disappointment. Today I officially resigned from my teaching position next year. Being a teacher has been an amazing, humbling and gratifying experience. I am honored to impact students and encourage them to share their opinions while taking in the perspectives of others. I have a great passion for teaching. But today, I sailed away from the harbor. What surprises me the most is not that I resigned (I have surely switched schools before) but that I don’t have a harbor to go to. Before, my moves have been calculated. I have sought out a position before letting go of where I am at. Second, my situation is unique in that I am the single provider for my family. This decision impacts my children and I don’t have another income to support our family if my plan doesn’t come together. In essence, as I write this, I am scared and nervous. So why did I do this? Why would I decide not to return to my building next year and risk so much? Professional goals: First, I desperately want to become a hybrid teacher where I both teach and am a mathematics instructional coach. I adore teaching students and I also enjoy allowing teachers to have their own “ah-ha” moments. If I don’t let go of where I am at, I may never fully invest energy into reaching my professional goals. Pushing past fear: I spent some concentrated thought thinking about why I wasn’t letting go and moving on. After this internal conversation, I realized that fear was driving my decision making. If you have read any of my previous post, one of my greatest life lessons is to accept fear as a natural feeling and move forward anyways. I want to live life fully and understand that mistakes and missteps will happen. As such, I am choosing not to live in fear of the unknown. Repeated cycle: Last year, I thought about leaving too yet, decided to stay for various reasons. As I made this decision today, I thought about what I would feel in a year or two years. I decided that the feeling would still exist. I no longer wanted to repeat the same deliberation again. I don’t want to live in regret or in waiting. As such, I decided now was the time to move on. Being a realist: The district I work in wonderful in many ways. A small farming community, it has a sense of family, closeness and friendliness that is not found in many places. However, the one thing it is lacking is an opportunity to be a math coach. The current focus is in technology (which is completely necessary and essential to our students’ future careers). As much as I was hoping that the district developed a role as a math coach, I have learned that sometimes you have to see things for what they are not for what you want them to be. I realized that my future goals could not happen if a position was not going to come available. Hope: Sometimes in moments of great uncertainty, unexpected opportunities are birthed. I have limited knowledge of what I can become or the role I could fill. I now set out with great hope that the right role presents itself and I am at a place to accept such an opportunity. For the moment, I am lost, confused and uncertain of what position I will accept for next year. But, I am ready for the opportunity for a new challenge to present itself. It is time for me to continuing growing as a professional. Until I find the next harbor I will dock at, I will enjoy the journey amongst the waves knowing that these are the moments that define my character, reshape my life and celebrate my strength. When I began teaching, it was with a school I knew I wanted to teach at forever. Circumstances changed and I had to look further afield. While traveling through that sea, I found my port at a much larger school district, and I did find something that I didn’t even know existed! My prayers are with you in your journey! Thank you for sharing your story. 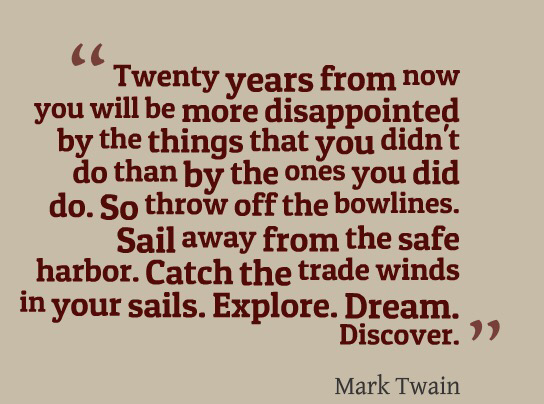 Such a hard decision but bound in faith that a new adventure exists! 🙂 I am hopeful your placement and my story will share a similar ending in the “right” feeling.